ERA Environmental is constantly working to give you the most powerful, cost-effective, and customizable EH&S management tools in the world. We're proud to unveil our new and improved interface with advanced customization options designed to deliver the best possible experience. Customizing your ERA-EMS dashboard has been made even simpler using new dashboard widgets and an improved quicklinks menu. These new customization options have been rolled out in tandem with the introduction of the new, streamlined ERA-EMS interface. The ERA-EMS has been customized so that you only see modules and forms needed for your tasks - software tailored specifically to you. The new Dashboard Widgets enable any ERA-EMS user to set up their dashboards to display the information they need. Using dashboard widgets allows you to quickly get a snapshot of your compliance progress, including training stats, recent reports, compliance notifications, and executive KPI reports. Your personalized dashboard will not affect any other manager or employee's dashboard settings: it's your dashboard. To customize your dashboard with widgets, click the down arrow symbol in the top-right corner of the screen. Click on the + to add a widget from your dashboard or the - symbol to remove it from your dashboard. Once a widget has been added to your dashboard it can be positioned as desired. 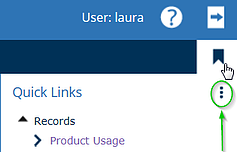 You can also quickly access ERA menus you use frequently by adding them to your customized quicklinks menu. These quicklinks can be accessed at any time, without the need to navigate through modules. You can then select which menus and modules to add to your customized quicklinks list by navigating through the menu trees and checking off all the desired menus and forms you need. With these new improvements, navigating through your custom ERA-EMS is easier and faster than ever.